Usually whenever I come across an 8’bit inspired game it looks like crap. Being totally honest these days for me it seems a lot of games that harken back to yesteryear do so to let players know not to expect much. Alwa’s Awakening actually looks good. From what I’ve seen from the trailers and gifs I am hopeful. Dare I even say excited!?!?!?! Alwa’s Awakening is a successful Steam Greenlight platforming game that recently caught my eye. Best of all I don’t need to wait forever to get my hands on it. Alwa’s Awakening is coming to Steam February 2nd, 2017. Color me interested. It’s gonna cost $9.99 and be available for PC, OSX and Linux. It’s a Metroidvania game (W00t!!!!) that is classically inspired by NES games of old. 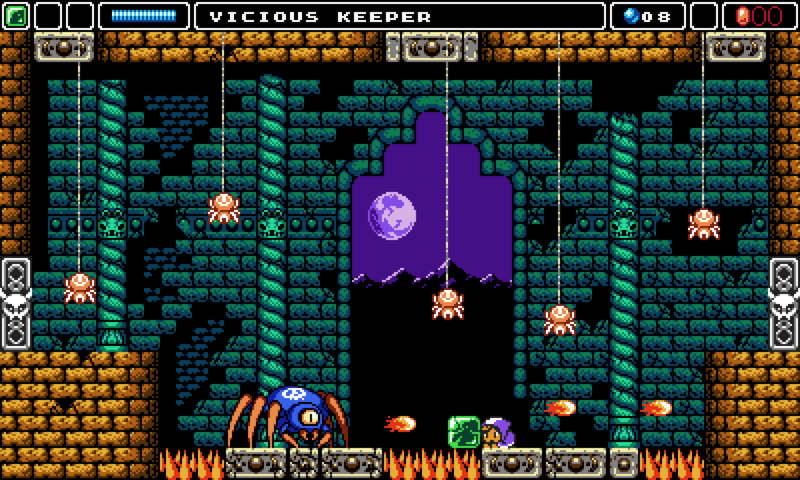 With upgradable items and abilities and a large interconnected Metroidvania inspired map. Travel to the land of Alwa and help the people living there awaken from their nightmare… You are Zoe and you have been sent for to help save the land. Equip your magic staff and progress through a large interconnected world where you’ll solve puzzles, fight enemies and defeat bosses. A new challenging NES-inspired adventure game with the feel and look of a Nintendo 8-bit game. Inspired by games such as Battle of Olympus and Trine. Equip a magic staff that holds many mysterious powers. Use it to solve puzzles and to defeat enemies in over 350 completely unique rooms. Find new gemstones to make your staff more powerful. Play as Zoe who has been sent for to help free the land of Alwa. With easy to understand controls, you’ll jump and fight your way through many different challenges. Explore a large interconnected world map in true ‘Metroidvania’ style. Unlock new abilities and find new items that lets you progress deeper and deeper into the land of Alwa. Find and unlock a slew of different objects throughout the adventure that will both give Zoe new abilities as well as unlock new areas. Talk with the people living in Alwa and uncover more secrets about the world. Listen to a completely new 8-bit soundtrack with over 25 new original tracks composed by Robert Kreese. Soundtrack releasing both on YouTube and Spotify when the game is out. A few tracks are already available on YouTube.